Ready for an experience of a lifetime? Spend a magical night in the fairytale valley between the mountains. Look up from the soft bed in one of our unique, heated tents and, whenever the Aurora begins its dance, watch it dancing behind the tent windows. Feel the natural flow of life in the Arctic, with some luxury added. Inspired by the ways of living of the Sami people, Camp North Tour will give you the first-hand experience of the native life. Situated in the fairytale valley, about 40 minutes from the centre of Tromsø, the camp is also a great spot to observe the Aurora. Whenever the Aurora appears in the sky, the valley, protected from the light pollution, highlights the spectacle. If you have any special wishes, just let us know and we will try to make it a very special experience for you, just the way you would like it. Join one of the adventures that will show you even more of this beautiful area. Tommy and his incredible dogs have maybe lived here forever. He knows them very well and they know him, love him and trust him, too. They also know the area, every hill, every path, every single tree. And they are no ordinary dogs. They are a unique team of racing dogs, with the experience in some of the most challenging dogsledding races in the world. Just for a short while, leave behind the city rush of Tromsø and join this cheerful group. Come to our secluded valley and let them carry you farther into the wild. Look around and enjoy the magic. During this unique ride you will hear Tommy’s stories of his life with the dogs. Morning tour will show you the beautiful landscape of our magical valley. Evening tour might show you the aurora, if you're lucky! Our Summer Island Tour will introduce you to the unique landscape of the area with its richly developed coastline, its fjords, peninsulas and islands. See the sea water changing its depth and colour from bright turquoise to dark, navy blue. Look at the moss-covered hills in the shades of green and red. Travel through the areas where you'll have a chance to see the reindeer, look out for the eagles and maybe even meet the moose family living on Kvaløy, the Whale Island. Learn about the local ways of living, the old traditions, the calm life of fishing villages in the past and present. We find it very important that you have a great experience during the trip. Our great guides will tell you about the area, local nature and culture. You can always ask questions, chat and really get to know the places that you are visiting. 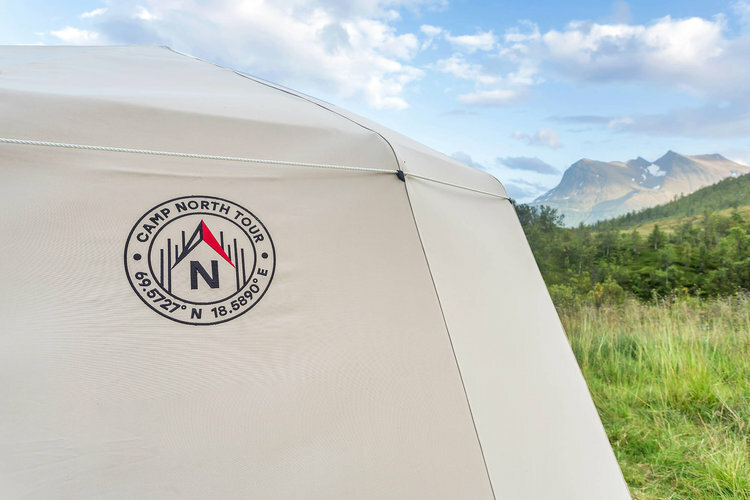 Our camp is situated 40 minutes from Tromsø, the capital of the Arctic. If you haven’t been to the Arctic yet, maybe you will fall in love with Tromsø, just like we have. Tromsø lies in Northern Norway, 350 kilometres north of the Arctic Circle and is surrounded by beautiful fjords and mountains. Human settlement dates back more than 10,000 years, whilst the local Sami culture is at least 2,000 years old. Tromsø was founded in 1794, and has a population of about 70,000 and covers an area of 2,516 square kilometres. Between 21 November and 21 January, the sun disappears below the horizon and the polar night sets in. It is not completely dark in the middle of the day, however, and the light and colour in the sky during that time of year is very special – it is called the blue twilight. Whether you're going on a dogsledding trip or just planning to walk around outside in the city Tromsø, you should never forget that you are visiting the Arctic. You might not need to take an umbrealla, but opt for a windproof coat with a built-in hood and put on a warm base layer close to your skin. And not to mention some serious winterboots and socks to keep your feet warm when walking in the snow.